First of all, I would like to thank Mr. Uli Jon Roth for giving us the opportunity to have these dream guitars! 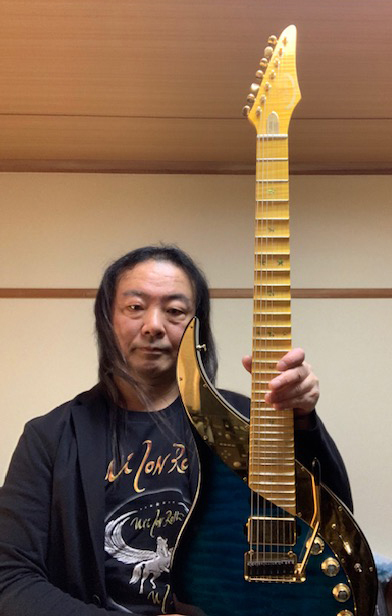 I respect him from the bottom of my heart and I wanted to have Sky Guitars to experience the feeling of him. Sky Guitars have very high quality and the sound from the actual guitars is beautiful. Mega-Wing Pickups System has power and it is versatile. I can have enough sustain even at the very high notes. And it is almost noiseless. With gain control and 3-band EQ, I can enjoy various sounds. And it is a great invention to have the fingerboard on pickups. It gives original tone to the neck pickup. It feels really good when I play with the neck pickup with clean sound. This is the ultimate guitar that Uli created with his endless pursuit for music. I think the vintage guitars will take you to the journey to the good old days and the Sky Guitars will take you to the journey to the future! I really thank Uli! Thank you very much!